For other uses, see Midnight Run (disambiguation). Midnight Run is a 1988 American buddy cop action comedy film directed by Martin Brest and starring Robert De Niro and Charles Grodin. Yaphet Kotto, John Ashton, Dennis Farina, Joe Pantoliano, and Philip Baker Hall play supporting roles. A critical and commercial success, the film was followed by The Midnight Run Action Pack in 1994, three made for television sequels which did not feature any of the principal actors, although a few characters are carried over from the first film. Bounty hunter Jack Walsh is enlisted by bail bondsman Eddie Moscone to bring accountant Jonathan "The Duke" Mardukas back to Los Angeles. The accountant had embezzled $15 million from Chicago mob boss Jimmy Serrano before skipping on the $450,000 bail Moscone had posted for him. Walsh must bring Mardukas back within five days, or Moscone defaults. Moscone says the job is easy, a "midnight run," but Walsh demands $100,000. Walsh is then approached by FBI Agent Alonzo Mosely, who wants Mardukas to be a witness against Serrano and orders Walsh to keep away from Mardukas. Walsh takes no notice of this and instead steals Mosely's ID, which he uses to pass himself off as an FBI agent along his journey. Serrano's henchmen Tony and Joey offer Walsh $1 million to turn Mardukas over to them, but he turns them down. Walsh captures Mardukas in New York City and calls Moscone from the airport, not knowing that Moscone's line is tapped by the FBI and that his assistant Jerry is secretly tipping off Serrano's men. However, Mardukas fakes a panic attack on the plane, forcing the two men to travel via train. When Walsh and Mardukas fail to show up in Los Angeles on time, Moscone brings in rival bounty hunter Marvin Dorfler to find them. Dorfler tracks them to the train and attempts to take The Duke from Walsh, but Walsh gets the drop on him and leaves the train. However, he discovers when he attempts to purchase bus tickets with a credit card that Dorfler canceled the card. Without funds, he is forced to rely on other means to get across the country, including stealing cars, borrowing his ex-wife's car in Chicago, and hitchhiking. Meanwhile, word of the skirmish on the train reaches Mosely's ears and he leads a task force to find Walsh and Mardukas. Walsh eventually reveals that, 10 years before, he was an undercover officer in Chicago trying to get close to a drug dealer who had almost the entire police force on his payroll. Eventually, just as Jack was going to bust the dealer, he had heroin planted in his house by corrupt cops. In order to avoid either going to prison or working for the dealer, Walsh resigned from the force, left Chicago and became a bounty hunter, while his wife divorced him and married a corrupt lieutenant. Since then, however, Walsh has clung to the vain hope that he will one day be reunited with his ex-wife. Later, Mardukas learns that the drug dealer was Serrano. In Arizona, Dorfler takes Mardukas away from Walsh, who is found by Mosely. While arguing with Moscone over the phone, Walsh realizes that Dorfler intends to turn Mardukas over to Serrano for $2 million. However, Dorfler accidentally reveals to Serrano's men where he is keeping Mardukas and is knocked unconscious by Serrano's men, who go after Mardukas themselves. Walsh calls Serrano's men and bluffs that he has computer disks created by Mardukas with enough information to put Serrano away, but promises to hand the disks over if Serrano returns Mardukas to him unharmed. Jack meets up with Serrano while wearing a wire and being watched by the FBI. Dorfler spots Mardukas and interrupts the exchange, unknowingly disabling the wire. After Serrano takes the disks, the FBI closes in, arresting Serrano and his henchmen. Mosely turns Mardukas over to Walsh with enough time to return him to Los Angeles by the deadline. However, Walsh realizes that he cannot bring himself to send Mardukas to prison, and lets him go. Before parting, Walsh gives Mardukas a watch that his wife gave him before their marriage, symbolizing he has finally let go of her. In return, Mardukas gives Walsh $300,000 in a money belt he had been hiding. Walsh flags down a taxi and asks the driver if he has change for a $1,000 bill, but the taxi drives away, so he heads home on foot. After completing The Untouchables, De Niro wanted to try something different and decided on appearing in a comedy. He pursued the lead role in Penny Marshall's film, Big. Marshall was interested, but the studio was not, so the role went to Tom Hanks. Martin Brest, who directed Beverly Hills Cop, had developed a script with George Gallo that blended elements of comedy and action. Gallo says he based the relationship between Jack and the Duke on his own parents. "I don't think they ever realized how funny they were when they were arguing about something," he said. "My father was very emotional whereas my mother was far more calculating. She would let him talk and lead him down alleys and then strike like a cat." Gallo paid tribute to Martin Brest, saying "Marty was highly focused, where I was a bit more all over the place. I'm not a person who suffers from not having ideas. If anything, I have too many ideas. Marty helped rein me in to stay focused on the main story. This has helped me a great deal since my collaboration with him." Paramount Pictures was originally interested in backing Midnight Run, but they wanted a big name star opposite De Niro in order to improve the film's chances at the box office. Their production executives suggested that the Mardukas character be changed to a woman and wanted Cher for the role in the hope she would provide some "sexual overtones". When Brest rejected the idea, Paramount suggested teaming De Niro up with Robin Williams, who became eager to get the role and offered to audition for Brest. At one stage Bruce Willis was mentioned as a possible co star. Brest was impressed by Grodin's audition with De Niro, however, feeling that there was a real chemistry between the two actors. As a result, Paramount backed out and their UIP partner Universal Studios became interested in the project. Paramount president Ned Tanen claimed that the budget became too high and he decided that "it wasn't worth it". Universal executive Casey Silver had worked with Brest on Beverly Hills Cop and he was integral in setting up the project at Universal. To research for his role, De Niro worked with real-life bounty hunters and police officers. As Walsh uncuffs Mardukas on the train, the latter says, "Thanks, 'cause they're starting to cut into my wrists.'" In fact, Grodin has permanent scars resulting from the handcuffs he had to wear for most of the film. The scene where Mardukas falls off a cliff was shot on location in the Salt River Canyon in White Mountain, Arizona and the conclusion, taking place in rapids, was shot in New Zealand because the water was too cold in Arizona. "I trusted Marty would choose the material that was most suited for the scene," said De Niro. "He's aware of everything in Chuck's style, in my style. He had to balance all that, and I think he did it very well." Yaphet Kotto remembers the film being a difficult shoot. DeNiro is very spontaneous and it always helps to work with an artist like that. But Marty Brest! "Herr Director" shot so many takes of the scenes that I lost all joy in doing the film. It became hard and tedious work. Then he stopped eating during the shoot and became thinner and thinner each day, until he looked like a ghost behind the camera. When I met Marty at the Universal studio with DeNiro, he looked healthy and strong, but as filming went on, he began to turn into someone you'd see in Dachau. It was weird. I got sick and for the whole of the film I had a fever and was under the weather for most of it ... I was shocked when it came off so funny ... It sure wasn't funny making it. Universal invested $15 million in a print and television advertising campaign. The film's score was composed by Danny Elfman, and the album was released by MCA Records. Note: The end credits track as heard in the film is instrumental. "Try To Believe" was redone on Oingo Boingo's Dark at the End of the Tunnel album. Midnight Run was released on July 20, 1988, in 1,158 theaters, grossing US$5.5 million in its opening weekend. It went on to make $38.4 million in North America and $43.2 million in the rest of the world for a worldwide total of $81.6 million. 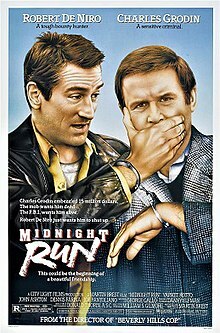 Midnight Run has a 96% score at Rotten Tomatoes based on 45 reviews. Film critic Roger Ebert gave the film 3.5 out of 4 stars and wrote, "What Midnight Run does with these two characters is astonishing, because it's accomplished within the structure of a comic thriller ... It's rare for a thriller to end with a scene of genuinely moving intimacy, but this one does, and it earns it." In his review for The Globe and Mail, Jay Scott praised the performances: "De Niro has the time of his acting life lightening up and sending up all those raging bulls that won him all those Oscars ... Charles Grodin, master of the double-take and maestro of the slow burn, the best light character comic since Jack Benny stopped playing himself". Vincent Canby, in his review for The New York Times, wrote, "Mr. De Niro and Mr. Grodin are lunatic delights, which is somewhat more than can be said for the movie, whose mechanics keep getting in the way of the performances". In his review for The Washington Post, Hal Hinson says of the director that, "carrying the dead weight of George Gallo's script, Brest isn't up to the strenuous task of transforming his uninspired genre material in [sic] something deeper, and so the attempts to mix pathos with comedy strike us merely as wild and disorienting vacillations in tone". David Ansen, in his review for Newsweek, wrote, "The outline of George Gallo's script—odd-couple antagonists become buddies under perilous circumstances—was stale five years ago, and the outcome offers no surprises. Too bad: a lot of good work has been wasted on an unworthy cause". George Gallo put the success of the movie down to the relationship between Jack and the Duke. In many ways it is a love story, although it is one that is short lived. They meet each other, take an instant dislike to one another and over time grow to respect each other which leads to deeper feelings. Both men realize, despite their differences, that they share core beliefs of what is right and wrong. Audiences also think that the road trip angle to the story rings true. Everyone who has ever gone on a long road trip knows that things can go wrong and, as a result, adults can be reduced to behaving like children. No matter how well a script is written, it has to be fully realized by the director and actors. Every last person working on the film did a terrific job. De Niro attributed a lot of the film's eventual success to Charles Grodin. "The way Chuck Grodin is, it worked," he said. "His character was irritating and Chuck knew how to do that, to work that. I felt like that was a good way to go." ^ Hollywood Opens Its Summer Onslaught By ALJEAN HARMETZ Special to The New York Times. New York Times (1923-Current file) [New York, N.Y] 26 May 1988: C27. ^ a b c d e f g Parker, John (1995). "De Niro". Victor Gollancz. ^ a b c "Midnight Run: Interview with writer George Gallo". ^ Casting snags postpone 'Caddyshack' sequel Beck, Marilyn. Chicago Tribune (1963-Current file) [Chicago, Ill] 24 Sep 1987: 13C. ^ a b "De Niro is Making the Publicity Rounds". St. Petersburg Times. May 23, 1988. pp. 3D. ^ A big deal in Hollywood: Universal's new boss gets down to business Thompson, Anne. Chicago Tribune (1963-Current file) [Chicago, Ill] 05 Nov 1987: D9. ^ O'Regan, Michael (July 17, 1988). "The Private De Niro". Sunday Mail. ^ Grodin, Charles (1989). "It Would Be So Nice If You Weren't Here". William & Morrow & Company, Inc.
^ van Gelder, Laurence (July 21, 1988). "Off a Cliff, Across an Ocean: Splash!". The New York Times. p. 19. ^ "A Rare Talk With Robert De Niro". Rolling Stone. ^ "Midnight Run". Box Office Mojo. IMDb. Retrieved 2008-12-18. ^ "Midnight Run". 11 July 1988. ^ Ebert, Roger (July 20, 1988). "Midnight Run". Chicago Sun-Times. Retrieved December 18, 2008. ^ Scott, Jay (July 20, 1988). "Midnight Run". The Globe and Mail. Toronto. ^ Canby, Vincent (July 20, 1988). "De Niro and Grodin in Cross-Country Chase". The New York Times. Retrieved March 16, 2009. ^ Hinson, Hal (July 20, 1988). "Random Bounty". The Washington Post. Retrieved December 18, 2008. ^ Ansen, David (July 25, 1988). "Reactivating Action Heroes". Newsweek. ^ Drew Taylor (20 April 2012). "Robert De Niro Talks 'Deer Hunter' & 'Midnight Run 2' And - The Playlist". The Playlist.